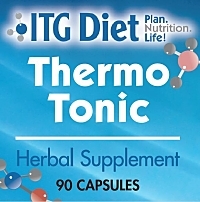 Thermo Tonic contains Bitter Orange which contains alkaloids such as synephrine and octopamine, adrenergic agents with beta-agonist activity. These stimulate lipolysis and increase the resting metabolic rate in some people, thus increasing the removal and oxidation of fat from adipose tissue stores. This action is potentiated by methylxanthines, such as the caffeine present in Guarana. Ginkgo Biloba can dilate blood vessels and improve peripheral and cerebral circulation. The ginsenosides present in Oriental Ginseng have a tonic effect on metabolism, and in particular can optimize hepatic metabolism, making the utilization of oxygen (for oxidative, energy-generating processes) more efficient. Do not exceed a dosage of 6 capsules per day nor take more than 2 capsules at one time. Wait at least 4 hours between does. Not for sale to, or use by, persons under the age of 18. Keep out of the reach of children!